There is a growing number of artisans who use all sorts of recycled materials. Would you have thought bicycle inner tubes would be one of those materials? Not me! 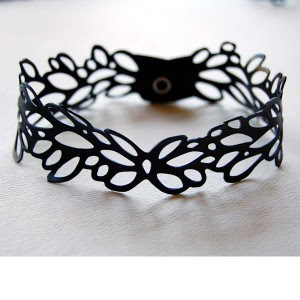 Portland, Oregon-based Barbi Touron, the creative genius behind Urban Lace, started collecting unwanted inner tubes from various bicycle shops in 2006. 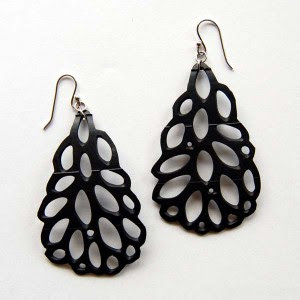 She then hand crafted the thoroughly urban chic filigree-like designs in her garage. The awesome jewelry is not only environmentally friendly but is also tough, durable and waterproof. There is only one color but hey, black goes with everything! Her handcrafted jewelry designs struck a chord and soon orders began pouring in and the collection took off! She later teamed up with Aaron Shear in order to keep up with the demand. Today "a percentage of their proceeds each year is donated to an environmental education group of their choice." Very innovative and wonderful jewelry! I like this idea...definitly a great way to recycle! It looks fabulous but does it have that awful rubbery smell? I don't find most common rubber products (rubber bands, rubber gloves) smell. But it's probably not a good idea for those who have more sensitive noses or who are allergic to rubber. What a clever, clever idea!